On Thursday the 8th of August the titular statue of Our Lady Assumed into Heaven was taken to the cemetery for Mass which was said at 7.00 p.m. Mass was celebrated by the Archpriest Can. Reuben Micallef. Can. Karm Cini, Fr Joe Borg MSSP, Mgr. Luigi Vella Archpriest Emeritus and Dun Gorg Vella, Fr Frankie Mallia and Fr Geoffrey G. Attard concelebrated. At about 7.35 p.m. the statue was taken shoulder-high to the parish square as the people gathered recited the meditated Rosary. The choir sang Marian hymns. As soon as the statue arrived in front of the Band Club, the Santa Marija Band welcomed the statue. A group photo was taken. The Band accompanied the statue to the square. Then the statue was put on its bredella within the church as the Band entered the church and the congregation sang the Innu lil Santa Marija. 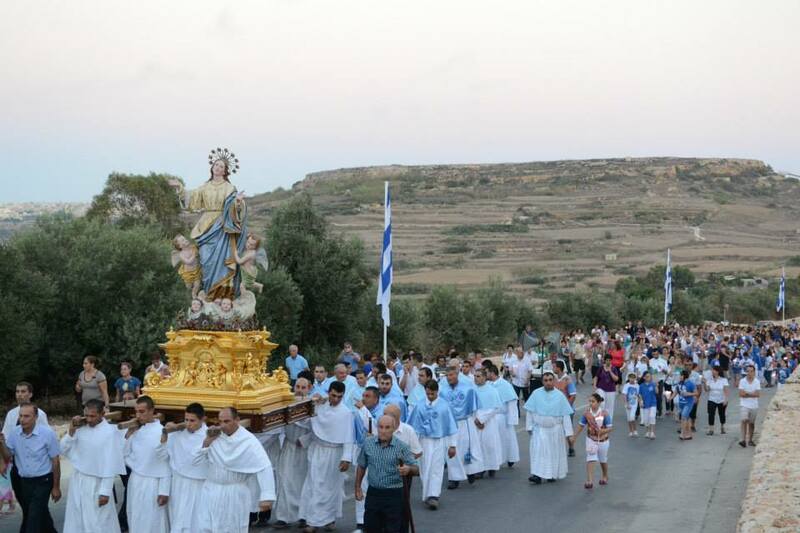 The pilgrimage was organized to celebrate the 150 anniversary of the statue.